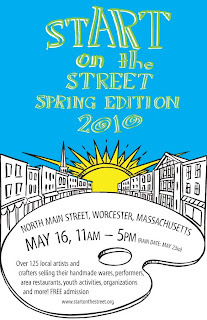 Please come and enjoy the wares of Bancroft Studios, City by the Sea Ceramics, and Thirteenth Story at the Worcester show called stART on The Street this May 16th. Come join the fun, which includes over 135 local artists and crafters selling their handmade wares, performers, area restaurants, youth activities, organizations and more assembled on North Main Street in Worcester, MA. 11am - 5pm.